Works For Me: Mom, I’m Bored! My best boredom-buster is popsicles. You know, the long, skinny ones in the clear plastic wrappers? The ones that are so outrageously cheap that a part of your brain wonders what’s in those things, but the rest of your brain says, “Shhh, it keeps them out of the house”? I supply the popsicle habit for my own kids and half the neighborhood. Command Central is the deep freezer in my garage. Because I would prefer not to have scads of children tracking in and out of my house all day, I’ve set up a quick way for them to open and dispose of the popsicles outside. I keep an empty grocery sack duct-taped to the front of the freezer, along with a pair of kids’ scissors attached with a piece of string. (I’ve found that whenever one can inject a little duct tape into one’s home-management practices, one ushers in an entirely new level of finery). The kids are able to get their popsicle, snip off the end, and throw away the plastic (DID YOU HEAR THAT KIDS? I SAID THROW AWAY THE PLASTIC!) all in one place, without tracking the popsicle/sandbox slush into my kitchen. And they’re happy. Or, if not happy, they’re sugared up, which is pretty much the same thing. Have a WFMW tip you’d like to share? 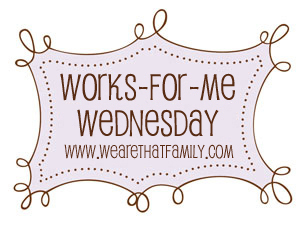 Visit We Are That Family for more great links. I just plugged in my new deep freeze in the garage earlier tonight. I never would have thought to move the popsicles out there. Thanks! I have one son and he’s still little (19 months) so I don’t have any tips of my own, but sure enjoyed yours 🙂 They make A LOT of sense! Aren’t kids genetically unable to throw away the plastic? My kids love those…but we find the wrappers wherever they finished the popsicle…except for the 4 year old. He does throw his away. But the 10, 9 and 2 year olds can’t manage it! Love the duct tape idea! 🙂 And I’m with Candace ~ I do believe kids have issues with using trash cans. I find all sorts of plastic wrappers everywhere around my house. Drives me crazy. Ooo . . . I love this. We always have an ample supply of the sugar sticks in our freezer, too. Until just now I was clueless as to how to tame the mess left behind by the multi-popsicle eaters in our neighborhood. Thanks Shannon. Headin’ for the duck tape NOW. Love having the scissors right there, too. Great idea! The scrub brush remark made me laugh. I literally had the pleasure of scrubbing a room’s worth of carpet as a child with a toothbrush because I uttered the word “bored” too many times. Looking back – I don’t blame my mom at all!!! I wish we had a freezer in the garage…heck, I wish we had a garage…I’ll have to come up with an alternate plan. I too offer a variety of jobs for those who suffer from boredom. It is a great remedy! ….and you are right. I think the “don’t ask….don’t tell” theory comes into play with those popsicle ingredients. Absolutely fantastic idea! Gonna go out and buy some today and set up my command post! LOVE it. Thanks for sharing! I’ve done this VERY thing! We have the deep freezer in the garage and they neighborhood kids already help themselves and school’s not even out yet. I’m wondering if I should tell them that there’s a placenta down in that deep freezer (It’s all sealed up and stuff, way far from the popsicles, mind you.) Can you believe I just admitted this in the comments here??? I can’t. My kids love these popsicles, as well. However, the little ones don’t like how COLD their hands get when eating them. I used to wrap them with a paper towel or something, but they kept needing help with it. The other day, I realized a good use for all the old kids socks in my rag drawer…slipped one over the end of the popsicle and wa-lah! A popsicle holder that stayed put and caught all the drips that otherwise would have made their hands all sticky! Just thought someone else might find that tip handy! Love your blog! Ahhhh, popsicles. Mine are kinda small too so they can’t really get them on their own. And, the worst part about popsicles is the mess and crying b/c of drips which would almost cancel out their usefulness for bordem solving. But luckily, genius that I am, I too have figured out how to prevent them from crying that their frozen treat it dripping all over their hands (which were filthy already so not sure what the big deal is). I cut a little slit in one of those super cheap paper plates and it all drips on there. I know it’s not very green, but I have to sacrifice a little for my sanity:) Great blog! And I really like the paper plates for popsicles on a stick idea. Will work for chocolate coated ice cream sticks, too. Mmm. You, my friend, are brilliant! I already have the garage freezer, but the scissors and the garbage bag….crazy smart! Thanks so much!!! We eat those all of the time in the summertime. When it’s 90+ degrees, those kind of treats are so welcome. Technically, those popsicles are made of high fructose corn syrup and artificial coloring. But they do keep the kids happy. We keep one of those large capacity construction site-style round igloo coolers with a drink dispenser on the back porch. We got it free from a freecycler, it was almost new, and bleached it within an inch of it’s life. We’ve been filling it with a fresh batch of ice and water daily, so they don’t come in and out for water. Occasionally after lunch I add one batch of lemonade to the “pot” and even though it’s very diluted they LOVE the lemon drink, and I think they actually consume more water than they ordinarily would if they had to come into the house. Oh, that is awesome! They work at distracting a tired and whining child too! Even my 16-month-old is a pro at eating one. As a mom whose oldest turns 18 in — gulp — 15 days, with 4 more spread way out behind her, my favorite summer blessing is popsicles. Any kind. Now that the youngest is 6, and can mostly finish a bigger one on a stick without dripping too much, I prefer these to the wretched plastic sleeves! My trick is to say no to everything and anything while I have the energy, then say yes to the popsicle when I need a really good break! (No one young enough for regular naps anymore.) Their mouths are quiet, they are HAPPY, and I feel like all is equalized if they’ve played in the neighbor’s yard all week and we can provide a “treat” … and share our popsicles. Well this is great for children. And even I don’t have children yet, I still believe this is really good! Beautiful! Easy, access snacks! Life is good. I have never thought to do the trash bag on the front of the freezer and the scissors…but I’ll definitely try that. We have trash cans with labels for recycling that the neighborhood kids actually use. Instead of throwing down their empty plastic drink bottle in someone’s yard, they know to bring it to our trashcan. I love it. Honestly, your writing style just CRACKS. ME. UP! Thanks for sharing what works for you! How I’d love to have a “command central” for our popsicles! !